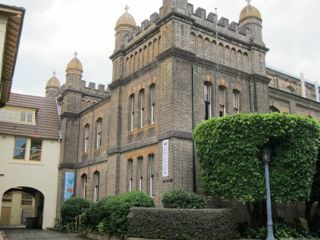 Turning back, on the northern side of Science Road, is the Macleay Museum building. Built during 1886 and 1887 it was designed specifically to house William John Macleay’s vast Natural History collections. Spacious, fireproof, airy and naturally lit, the Macleay building was a showpiece of nineteenth century Museum Architecture. Change was swift. Within three years of the opening of the Macleay Museum pressure began mounting from other University departments clamouring for teaching space. At various times the building played host to Botany, Geology, Engineering, Pathology and the University’s Volunteer Rifle Corps! Part of Wilkinson’s plan for remodelling Science Road included raising the roof over the centre of the building for a new lecture theatre and single-storey extensions. The appearance of the building was radically altered by the replacement of the original hipped roof with three gables, the removal of the porch and the addition of a balcony. The 1890s hipped roof form was restored in 1981. By 1925 the building bore little resemblance to its original character. Today, the Macleay Museum shares the Macleay Building with the School of Biological Sciences.